The 'hand shape codes' for your revised measurements are: + | + | +, which is indicative for the 'mixed' earth/fire zone. I hope you like the result...? I did wonder how you would categorize it and kind of expected you'd say earth/fire. In the CS system, I think they would be air with slightly short fingers but not short enough to be earth. I have air skin texture and air depth/width of lines. Very square looking palms, too square to be fire. I'd more identify with earth/air. Earlier I used a flexible ruler and didn't measure to the life line, but across the metacarpals. I thought for the chart you were should measure across the metacarpals (not the middle). Patti I had my hand facing up when using the ruler, so you could see the tip of the finger, but it still is a little difficult to read without the paper back ground. I am lost again on the chart. I need to take some more time to look at everything. I think Martijn adjusted it to measuring from the 'marriage line' to the start of the life line. There is from 1 to 2 mm difference between measuring across just under the fingers and at this location in my palms. Patti, I also mentioned that one can try to find the 'shortest' palm breadth in that zone... so then it should become easy to choose. PS. However, I wouldn't recommend to measure 'just below the fingers', because then the measurement will likely become smaller... for, the measurement is then probably made at a position beyond the metacarpals. The X-rays picture below shows as well that 'just below the fingers' is beyond the metacarpals: you will then sort of be measuring at the proximal phalanges of the fingers. In general, the start of the life line is a good point of reference... but only when the life line is starting at the normal location. Regarding the fl/pb values (0.95 and 0.937), both are really much closer to the '+' category (so only the '++' aspect is not correct). By the way, regarding the C.S. system... short fingers are only associated with fire and earth (and not with air). However yes, if other aspects of your hand relate to air, that could explain your association. Thanks for evaluating my hand shape. I did not understand the difference (for Hand shape code) between Fire & Pure Fire. In general, any 'pure' hand shape profile is the only profile which exactly matches with the typical proportions for a specific hand shape - while the other variants represent hands that show small variations from the 'pure' hand shape. Thanks Martijn for figuring out my hand shapes. So my right hand is fire and my left hand is borderline FIRE (+AIR)/WATER (+FIRE) hand shape. My left hand seems sort of a mess (esp. if you think about the CS system), but it does fall on the average mark for females. So I guess esp. for my left hand, the rest of the information found within the hand will make a bigger difference. tap I'm glad you are understanding it! I haven't replied to it yet because I am still trying to get my head around it. It seems SUCH a complicated way to assess handshape! Lynn how much do you consider the hand shape with everything else combined in a reading? It gives a general idea of the person's basic way of being, the fundamental personality, the way that they express their general energy out to the world. Of course we look at everything in conjunction with everything else. For fundamental characteristics especially look to skin texture and fingerprints to see what it is that they are manifesting in the mode of the handshape element. Maybe you have hit on something brilliant here, I don't know! I know you have put a lot of work into it. I haven't had time to study it in depth but I have looked at the chart and at the measurements people presented, and at the calculations done in order to ascertain their hand shape.... and it seems very complicated!! It seems unnecessary to do all those calculations! First glance at the palm width & palm length measurements instantly tell us (without working out %) that the palm is much longer than it is wide ie it is a rectangular palm. Finger length vs palm length - we don't even need to do the calculation to see it is shorter than 75%. ie short fingers, oblong palm = fire hand. I am still not convinced that fl/pb calculation is neccessary unless they have combination hand shape. Patti's hand isn't as straightforward as Mooky's, because of almost medium finger length (and because you are measuring across metacarpals I can't really compare it to 5-element system). As the palm is usually wider across the centre, I would agree with fire/earth handshape, tho fingers are slightly longer than standard fire/earth. In the CS system, I think they would be air with slightly short fingers but not short enough to be earth. I have air skin texture and air depth/width of lines. Very square looking palms, too square to be fire. I'd more identify with earth/air. In CS system, your palms are more rectangle than square, and the fingers are not long enough to be air. So basically a fire hand. For combination, actually the right hand is fire/air (finger length about same as palm width). Are you left handed? (left hand being wider than right hand)? Martijn, I am still trying to understand all this and haven't studied all the details yet. What did you base your 'pure' hand shape proportions on? In your article you mention that you based your study on 16 hand pictures presented by 4 authors. ie 4 hands of each elemental type. is this enough for an accurate study? The avatar is my hand but not perfectly outlined. My wrist line is high and not under the actual palm but on it. I've looked through a lot of scanned hands in my files and I've noticed that is common. My hands look so obviously square and I always thought they were too small to be earth. Earth tends to be more in the category with elementary type hands. I think fire more fitting than earth if I don't get to be air, but fire I thought was recognizable by the rectangular palms. Here are the photo examples from Johnny's book. Before we start making an assessment for those hands, I have featured each photo with a small dot representing the central location at the distal wrist crease and the crease connecting the 3th finger with the palm. Would you first mind to check if we agree about those locations? OK finally Martijn I get to catch up enough to answer your question! Illustration 18 of earth hand - we have a slight problem in that the hand is not aligned at the wrist which can distort the hand shape. illustration 25 air hand - in the photo above I notice the picture seems to be taken at an angle with the fingers leaning back away from the lens. This could affect our results. so already we are working with 3 things that might alter the perceived shape. Also I am aware that working with pictures from books, we can't be sure that the editors/printers didn't slightly alter the dimensions of the photo (to fit it on the page or whatever). Working with these photos on screen I am aware that my screen resolution can make a difference (but I have the book so I can see the original pictures there). earth and water hand wrist dot look slightly too far to the right, I think the other two look ok. But I don't want to argue much over the wrist dots. I will look at the book now to make my assessments of the handshapes. When you study the 4 different hand shapes in Johnny's examples the big difference I notice in the palms is actually under the little finger to the wrist. This is where you see the square shape on the earth and air palms and the longer rectangle on the fire and water palms. This, I think, is where 'eyeballing' plays an important role. If I compare my palms to these, they look more like the air palm - in particular the area from little finger to wrist. re "My hands look so obviously square and I always thought they were too small to be earth" Air hands are bigger than earth hands. 7.5 (f) x 8 (w) x 10 (l) , your hand is not far off standard fire - palm being a few mm shorter than standard fire. Finger length vs palm length being 78-79% is just short of medium fingers. Also finger length is less than palm breadth, so again it would be fire hand. (or maybe just tending to be fire/earth). In a face-to-face reading (without measuring) I think I would say fire. You obviously get a sense of relating to air features but I would guess that is elsewhere in your hands. 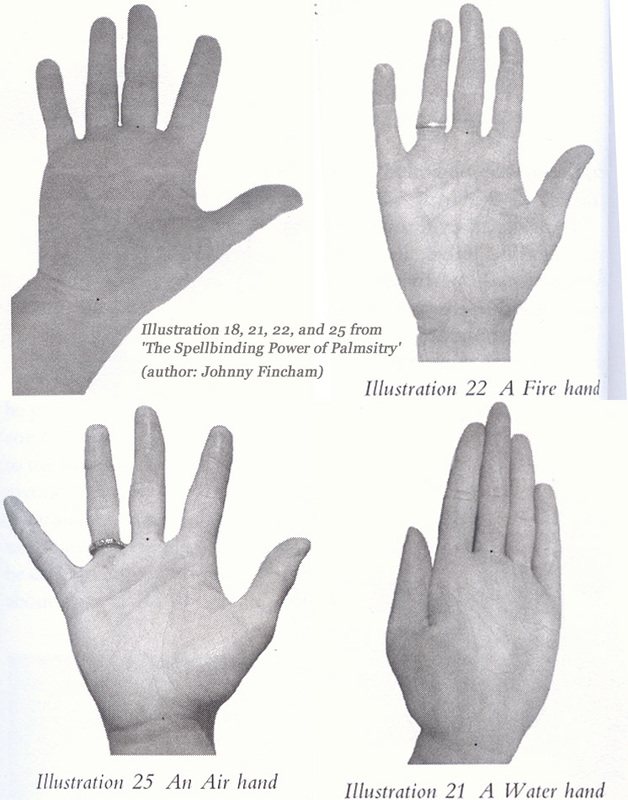 Patti wrote: When you study the 4 different hand shapes in Johnny's examples the big difference I notice in the palms is actually under the little finger to the wrist. This is where you see the square shape on the earth and air palms and the longer rectangle on the fire and water palms. This, I think, is where 'eyeballing' plays an important role. If I compare my palms to these, they look more like the air palm - in particular the area from little finger to wrist. Patti I am not exactly sure what you mean. The square/rectangular shape also involves looking at the width compared to length. Tho I agree with you that in face-to-face readings 'eyeballing' plays an important role. Martijn, I think I am too tired to do this now! I just made some measurements from Johnny's book, will post them now (see if you agree) but will do the handshape assessment tomorrow. uh-oh, looking at water hand that is not correct either. sorry time for will have another look at it tomorrow evening. I think it relates quite a bit to having a 'trained eye' from experience. Each person would develop various landmarks on the palms to form their assessment over time. Which is why various samples of people who use the element system are not identical or closely matched to each other in measurements but still appear accurately placed in appearance. Although Johnny's examples may not have the proper measurements for the type they are placed in, I don't think any of them could be mistaken for another type than the one they have been assigned. Patti wrote: I think it relates quite a bit to having a 'trained eye' from experience. Each person would develop various landmarks on the palms to form their assessment over time. Which is why various samples of people who use the element system are not identical or closely matched to each other in measurements but still appear accurately placed in appearance. I agree with you. But I would like to see the original hands for Johnny's examples. I think also each handreader might be influenced by a) their own handshape/elemental balance and b)the clients that are drawn to them. eg Johnny sees loads of air hands and not many earth hands, with me it is the other way round. Re: About finger length: do you have normal finger length? My hands are here. Basic photos first then down the page links to large/detailed pics. My hand is interesting I think because the middle (3rd) finger's base is very high up on the palm. It is this that makes the measurements out of whack a bit I think. Makes my pinky look like it is low set. These ratios seem to show that it is the other three fingers that are high set instead. Make sense? This is one thing I like about Martijn's process/chart. It is not subjective guesswork as to the palm and finger sizes. It is fine for you Lynn since you have looked at thousands of hands. I still have no idea what a well developed mount looks like to be quite frank. Maybe Martijn can develop a system for that as well. Thanks for showing me the pics mooky. It confirms for me that your fingers are short in relation to your long palm. Saturn is usually set a bit higher than the other fingers, with pinky the lowest, creating a curve if you draw across base of fingers. Your finger setting looks 'normal' to me. Yes, by mistake I had displayed the old values for your right hand - I have corrected this now in the post where I present an overview of the participants (old and new values are presented - the tendency for you having a hand shape closest to earth (+fire) is clearly visible now). PS. Interesting to see you talking about your hands, sounds like a confirmation regarding the earth (+fire) assessment. Lynn wrote: tap I'm glad you are understanding it! I haven't replied to it yet because I am still trying to get my head around it. It seems SUCH a complicated way to assess handshape! Lynn, it is really that complicated for you? After all, you described yourself that you are very familiar with doing measurements... and since you have developed yourself a few criteria regarding the percentages, I don't think that my method is complicated at all. Regarding Tap's 'hand shape profile', while you speak of 'nonsense'... I would interpret the code showing that Tap's left hand is very hard to classify - specificly because it concerns a borderline 'mixed hand shape' with fire involved (and earth is missing) ... and because it is close to medium hand shape - which I would describe (based on the metacarpal approach) as: 8 x 8 x 10. And... I think that knowing Tap's 'hand shape profile' could actually be very useful info in the perspective of finding out which 'hand type' is dominant in her as a person (which would require an analysis of other hand aspects as well). Though I would agree if you would have added that 'mixed' code combinations itself are not suitable to be translated into specific personality characteristics, etc.